Nov. 14, 2016 – It is very likely that 2016 will be the hottest year on record, with global temperatures even higher than the record-breaking temperatures in 2015. 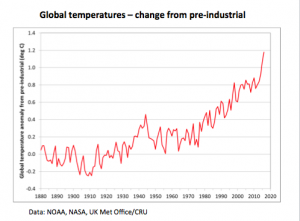 Preliminary data shows that 2016’s global temperatures are approximately 1.2° Celsius above pre-industrial levels, according to an assessment by the World Meteorological Organization (WMO). Long-term climate change indicators are also record breaking. Concentrations of major greenhouse gases in the atmosphere continue to increase to new records. Arctic sea ice remained at very low levels, especially during early 2016 and the October re-freezing period, and there was significant and very early melting of the Greenland ice sheet. Ocean heat was boosted by the El Niño event, contributing to coral reef bleaching, and above-average sea-level rise. The deadliest event so far in 2016 has been Hurricane Matthew, which was Haiti’s worst humanitarian emergency since the 2010 earthquake. Throughout the year, extreme weather led to considerable socio-economic losses in all regions of the world. “In parts of Arctic Russia, temperatures were 6°C to 7°C above the long-term average. Many other Arctic and sub-Arctic regions in Russia, Alaska and northwest Canada were at least 3°C above average. We are used to measuring temperature records in fractions of a degree, and so this is different,” said Mr Taalas. “The Paris Agreement came into force in record time and with record global commitment. The World Meteorological Organization will support the translation of the Paris Agreement into action,” he said. “WMO is working to improve monitoring of greenhouse gas emissions to help countries reduce them. Better climate predictions over timescales of weeks to decades will help key sectors like agriculture, water management, health and energy plan for and adapt to the future. More impact-based weather forecasts and early warning systems will save lives both now and in the years ahead. There is a great need to strengthen the disaster early warning and climate service capabilities of especially developing countries. This is a powerful way to adapt to climate change,” said Mr Taalas. WMO published the provisional statement for 2016 to inform the United Nations Climate Change conference taking place in Marrakech, Morocco (COP22). The final statement will be released in early 2017. For the first time, the assessment includes input from UN partners on the humanitarian impact. It complements a report on the 2011-2015 global climate, which was also submitted to COP22 to give a longer-term picture of the climate and to address multi-year events like droughts. That report showed that, of 79 studies published by the Bulletin of the American Meteorological Society between 2011 and 2014, more than half found that human-induced climate change contributed to the extreme event in question. Some studies found that the probability of extreme heat increased by 10 times or more. Global temperatures for January to September 2016 were approximately 1.2°C above pre-industrial levels and 0.88°C (1.58°F) above the average for the 1961-1990 reference period. They were especially warm in the early months of the year, with record monthly anomalies of +1.12°C (+2.02°F) in February and +1.09°C (+1.96°F) in March. Operational October data from the European Centre for Medium Range Weather Forecasting ERA-40 reanalysis indicate that October temperature anomalies were similar to May to September ones. Temperatures were above the 1961-90 average over the vast majority of land areas. In parts of Arctic Russia around the Ob River estuary and Novaya Zemlya, they were 6°C to 7°C above average. Many other Arctic and sub-Arctic regions in Russia, Alaska and northwest Canada were at least 3°C above average. More than 90% of Northern Hemisphere land areas outside the tropics were at least 1°C above average. Temperatures were less extreme in the Southern Hemisphere, but many areas were still 1°C or more above average, including northern South America, northern and eastern Australia, and much of southern Africa. The only large land area with below-average temperatures was part of subtropical South America (northern and central Argentina, parts of Paraguay and lowland Bolivia). The most prominent area of below-normal sea surface temperatures was the Southern Ocean south of 45° South (especially around the Drake Passage between South America and Antarctica, where temperatures were more than 1°C below normal in places). Global sea levels rose about 15 millimetres between November 2014 and February 2016 as a result of El Niño, well above the post-1993 trend of 3 to 3.5 mm per year, with the early 2016 values reaching new record highs. Since February, sea levels have remained fairly stable. Annual average global carbon dioxide concentrations in 2015 reached 400 parts per million (ppm) for the first time. Initial observations indicate new records in 2016. At Cape Grim (Australia), CO2 levels in August averaged 401.42 ppm, compared with 398.13 ppm in August 2015. At Mauna Loa (Hawaii), mean weekly concentrations of CO2 as of 23 October were 402.07 ppm, compared with 398.50 ppm at the same time in 2015, whilst the May 2016 value of 407.7 ppm was the highest monthly value on record. Arctic sea ice extent was well below normal throughout the year. The seasonal minimum in September was 4.14 million square kilometres, the equal-second (with 2007) lowest extent on record after 2012. The winter maximum in March was the lowest on record. The autumn freeze-up has also been much slower than normal; the sea ice extent as of the end of October is the lowest on record for the time of year. After several years of well-above-normal values, Antarctic sea ice extent fell to near normal by the start of 2016. It reached a seasonal maximum nearly a month earlier than usual. It was still well below normal as of the end of October. Summer melting on the Greenland ice sheet was substantially above the 1990-2013 average, with especially strong melting in July, but was less than in the record melting year of 2012. Numerous weather events had major impacts in 2016. The most significant, in terms of casualties, was Hurricane Matthew in October. According to Haitian government figures at the start of November, there were 546 confirmed deaths and 438 injured as a result of the hurricane. After crossing Haiti, Matthew tracked north and went on to cause damage in Cuba and the Bahamas, before tracking along the east coast of the United States and making landfall in South Carolina, causing major flooding. Typhoon Lionrock caused destructive flooding and heavy casualties in the Democratic People’s Republic of Korea, and Cyclone Winston was the most severe tropical on record to affect Fiji. In total, there have been 78 tropical cyclones globally in 2016 as of 31 October, close to the long-term average. The Yangtze basin in China had its most significant summer floods since 1999, killing 310 people and causing an estimated US$14 billion in damage. Flooding and landslides in Sri Lanka in mid-May left more than 200 people dead or missing, and displaced several hundred thousand. Above-normal seasonal rainfall in the Sahel led to significant flooding in the Niger River basin, with the river reaching its highest levels in about 50 years in Mali. There were a number of major heatwaves during 2016. The year started with an extreme heatwave in southern Africa, exacerbated by the ongoing drought. Many stations set all-time records, including 42.7°C at Pretoria and 38.9°C at Johannesburg on 7 January. Thailand saw a national record of 44.6°C on 28 April. Phalodi saw a new record for India of 51.0°C on 19 May. Record or near-record temperatures occurred in parts of the Middle East and north Africa on a number of occasions in summer. Mitribah (Kuwait) recorded 54.0°C on July 21 which, subject to ratification through standard WMO procedures, will be the highest temperature on record for Asia. The following day, 53.9°C was recorded at Basra (Iraq) and 53.0°C at Delhoran (Iran). The most damaging wildfire in Canadian history occurred in May in the city of Fort McMurray in Alberta. The fire ultimately burned an area of about 590,000 hectares and was Canada’s most costly natural disaster. It led to the total evacuation of the city and ultimately destroyed 2,400 buildings, causing 4 billion Canadian dollars (US$3 billion) in insured losses and several billion more in other losses. Major droughts affected several parts of the world, most of them associated with the El Niño event, which had a big influence on precipitation. Southern Africa experienced a second consecutive bad rainy season in 2015-16. Most of the region normally receives little rain between May and October, and the World Food Programme estimates that 17 million people will require assistance during the “lean season” ahead of the next harvest in early 2017. Annual and long-term changes in the climate system can aggravate social, humanitarian and environmental pressure. According to International Organisation for Migration, population migration is expected to increase as a result of more frequent and potentially more intense weather-related disasters, competition and conflict over shrinking resources, and rising sea levels rendering coastal and low lying zones uninhabitable. According to United Nations High Commissioner for Refugees), in 2015 there were 19.2 million new displacements associated with weather, water, climate and geophysical hazards in 113 countries, more than twice as many as for conflict and violence. Of these, weather-related hazards triggered 14.7 million displacements. South and East Asia dominated in terms of the highest absolute figures, but no region of the world was unaffected. Equivalent data for 2016 are not yet available. Extreme weather and climate related events influenced by the strong El-Niño in 2015/2016 had significant negative impacts on agriculture and food security. More than 60 million people around the world were affected by these events, according to the Food and Agriculture Organization.